As I mentioned in a previous post, the quality of a country’s health care was a top consideration in determining where to take our family sabbatical. We had heard that Costa Rica ranked high along these lines, and confirmed this via research. By the way, researching information about a country like Costa Rica is challenging in its own right. It’s not that there is a dearth of information. In fact, it’s the opposite. There is an abundance. It’s just that because tourism is a major revenue generator for the country, a lot of the “facts” that are out there read like marketing material as opposed to quantifiable data. Two sites that I believe provide useful, objective information are The Real Costa Rica and ARCR. In any event, from what I can tell, here is how Costa Rica’s health care is structured. 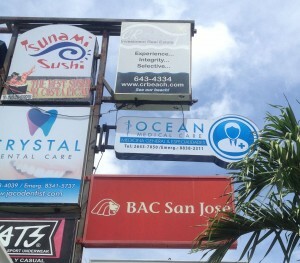 Costa Rica has two systems working simultaneously, the public and the private. 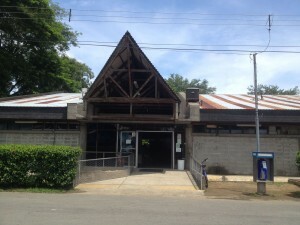 The Caja Costarricense de Seguro Social (which is the Costa Rican Department of Social Security, often referred to as “Caja” in Costa Rica) manages the public health care system. Citizens and legal residents are eligible for care within the public system. Permanent residents who have work permits are treated the same as citizens who have jobs. Both groups pay into the system through payroll tax contributions or self-employment tax for independent workers. Employees must contribute 9% of their salary towards the Caja, while employers must contribute 26% of an employee’s salary (I’ve seen conflicting information on the exact percentages, so don’t quote me on that). This money goes towards both medical care and a pension fund. If you’re not employed in Costa Rica, but you are a resident here on a rentista or pensionado visa, you now have to pay into the Caja system on a monthly basis. Depending on your age and your visa status, the monthly payment could range anywhere from $29-$442 per month. On the private side, there are a few well-regarded hospitals near San Jose. 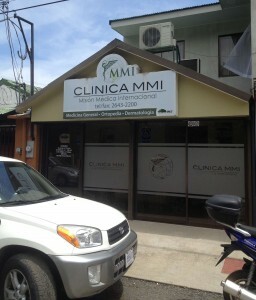 Located in Escazu, Hospital CIMA is the newest of the private hospitals. There is also Clinica Biblica in downtown San Jose, and Clinica Catolica in Guadalupe, a suburb of San Jose. In good driving conditions, all of these hospitals are over an hour away from us. Because we came from living in the city of Pittsburgh, we’re accustomed to having access to any number of hospitals within a 5 mile radius of our home. Since that was an impossibility here unless we were going to live in San Jose, it was important for us to locate medical clinics close to where we were going to live. Fortunately, Jaco has several. By the time we arrived here for good, we knew all of what I just outlined above. What we failed to do, however, is establish a relationship with a doctor or a clinic at the outset. I’ll explain below why that was a mistake. I didn’t know sleeping was a skill to be held in high esteem until Heather criticized me for it. Apparently, she is a really super awesome sleeper and I am simply not capable of reaching her talent level, regardless of how hard I try. In fact, Heather’s skill set of sleeping deeply is so overwhelmingly remarkable, she can sleep through the piercing sound of a smoke detector, the roar of a tropical thunderstorm, the screech of a car crash, and, most impressively, the incessant beeping of an alarm clock set to wake her up when she has a flight to catch. Unfortunately, my horrible tendency to wake up if I hear a noise in the house, or if something like an alarm designed to save our lives goes off, has been passed along to Atticus. His light-sleeping means that, so far in Costa Rica, he has woken up scared just about every night. In his defense, not only is it really dark here, but there are all sorts of sounds he’s not used to. Yes it disrupts everyone’s sleep, but he wasn’t a good sleeper in Pittsburgh either. So, sadly, weren’t used to it. For the record, I think Atticus cries way too much. It’s usually brought on by frustration and rarely a result of physical pain. The other night, however, was a little different. We heard him fall out of bed and let out a legitimate wail, which was distinct from his customary crying. Falling out of the bed really wouldn’t be that big of a deal in his room in Pittsburgh. In fact, he squirms around so much in his sleep, he’s landed on the floor numerous times. Here, however, his mattress sits 34” off the floor (I only know this because I actually measured it) and the floors are tile with a concrete subfloor. He ran into our room, exclaimed to us that he just dove head-first onto the floor, and that he had a really bad headache. Then he proceeded to throw up in Heather’s hands. Then he threw up again. Heather throws up more than she sneezes, so I don’t know if she’s freaked out at this point. But, for whatever reason, people in my house never got sick that way. Because it’s foreign to me, I generally deem it to be a major concern. In fact, prior to knowing Heather, if a friend had told me he was diagnosed with cancer and he threw up, I probably would have responded, “Whoa! You threw up?”. So, my paranoia, coupled with the reality that his head just bounced off one of the most solid floors I’ve ever felt, had us worried he had a concussion. Moreover, because we didn’t actually witness what had happened, our minds raced. What if it was a really bad fall and we’re wasting time deciding what to do while his brain is bleeding? If an emergency happened at home in Pittsburgh, we would just drive him to Children’s Hospital a few miles away. But here, we honestly weren’t sure of what exactly to do. We preach to Maddie and Atticus about having a plan in all situations, and we didn’t have a sound plan in that moment. Don’t get me wrong, Costa Rica has a 911 system. So if we had determined it was severe enough, we could have called 911 and presumably had him taken an hour and fifteen minutes to one of the hospitals near San Jose. But we didn’t think that was the best solution. Instead, we walked him through the steps we had learned at the hospital when we took him the other two times he had concussion scares in Pittsburgh. We checked his pupil response and eye movement and asked him a series of questions. Luckily, he was alert, coherent, and comical like always. We remembered that Atticus seemed lethargic (for him) earlier that day and probably hadn’t consumed enough water for how hot it was. Thus, despite our lack of a medical degree, we hesitantly concluded his illness was from heat exhaustion/dehydration and not from hitting his head. Crisis averted. The very next day, we talked to a trusted couple who have lived here a while and have taken their children to medical clinics in the Jaco area on many occasions. 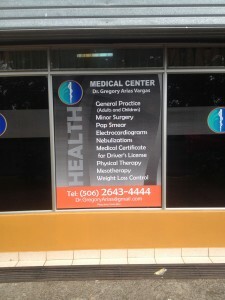 We received a reference from them for a physician we could call even in the middle of the night. We felt good about that after the fact, but it’s something we should have had lined up on day one. Because he is Atticus, we got to meet this new doctor days later. I have no idea what Atticus is going to be when he grows up. If I had to put money on it right now, I would say a Mechanical Engineer. He loves playing with tools, even though, as he’s been told repeatedly, tools are not toys. Nonetheless, he got ahold of a waiter’s corkscrew, which, as oenophiles and plain old winos know, has a folding knife on it to cut the foil when you open bottles of wine. 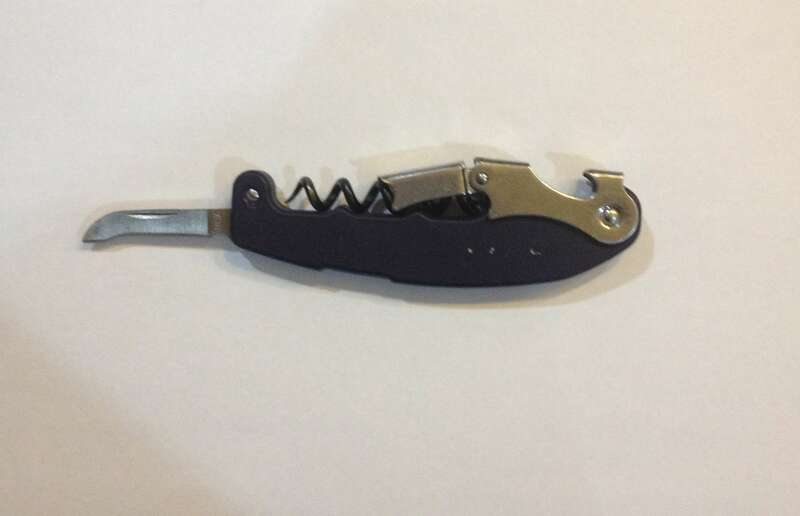 Of course he thought a folding blade was the coolest thing ever, so he unfolded it, and ran it across his finger. Heather and I don’t always see eye to eye on child-rearing, but we did in this scenario. In unison, Atticus received an unsympathetic verbal shaming of “We told you not to play with that knife!”. 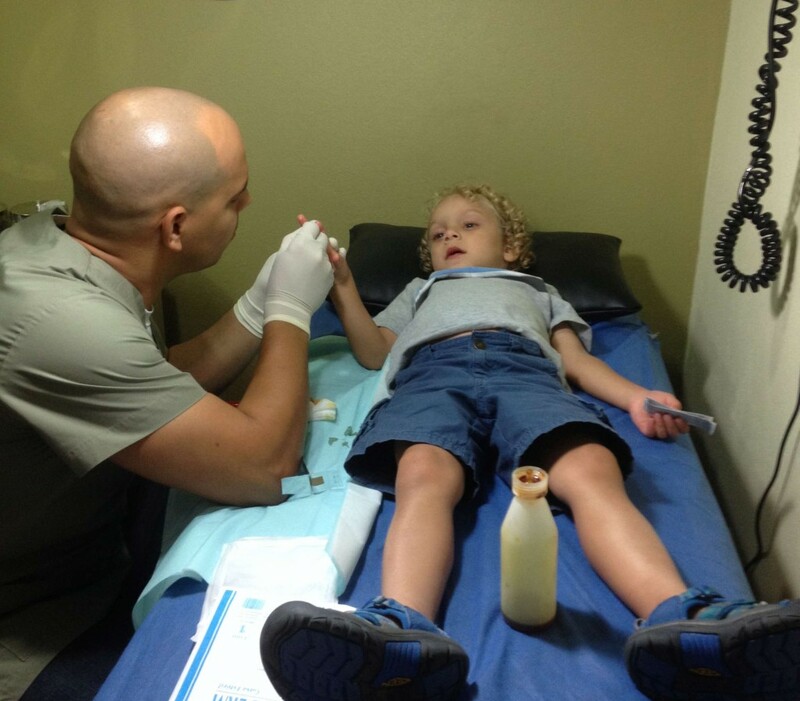 We washed his finger, applied Neosporin, bandaged it up, and thought everything would be fine. Well, being in a hot and humid climate teeming with life, coupled with swimming in the ocean just about every day, apparently allowed for the rapid growth of bacteria. Oh yeah, that and the fact that he consistently picks up arbitrary objects and then says, “Hey Daddy. Is this poop from an animal?”. The combination of all of those factors led to his finger getting badly infected. Another aspect of health care that is different here is that you can go to the Farmacia, explain your symptoms, and get an antibiotic. We showed the pharmacist his finger, she called a doctor, the doctor prescribed an antibiotic over the phone, and we were on our way. Unfortunately, after multiple doses of the antibiotic, it wasn’t getting better. 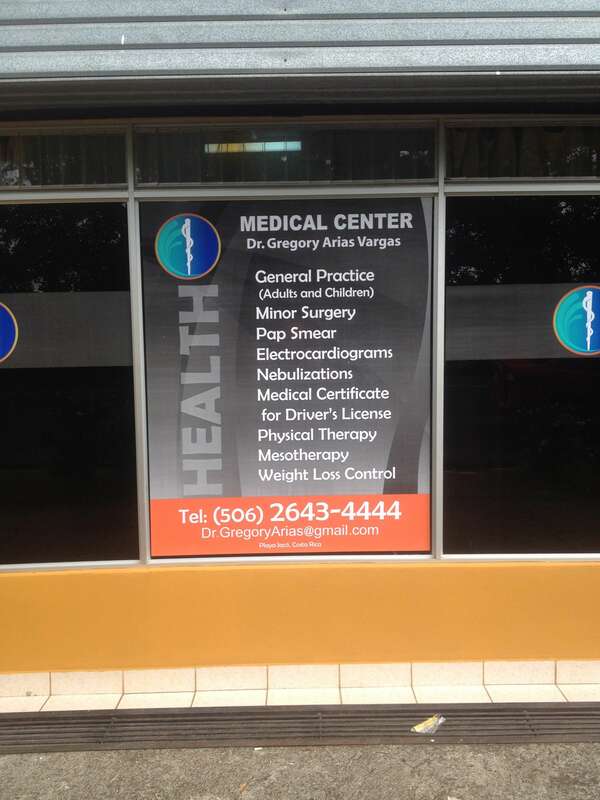 So we made a stop into the clinic which was recommended by our friends. 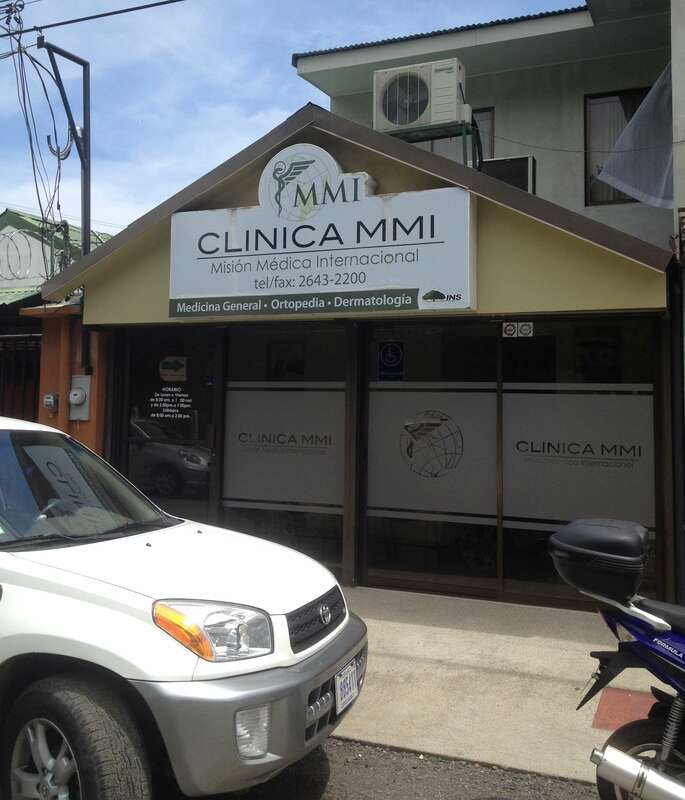 The physician at Clinica MMI is a man from Cuba named Hector who lives above his office. He provided medical aid to patients in Pakistan in 2005 after the earthquake in Kashmir that killed 75,000 people, and also practiced for a time in Nicaragua. He seemed really happy to be in Costa Rica and referred to it as a “paradise” in terms of facilities and resources by comparison. After a brief conversation about the U.S. embargo against Cuba and the longevity of the Castro brothers, he got down to business. 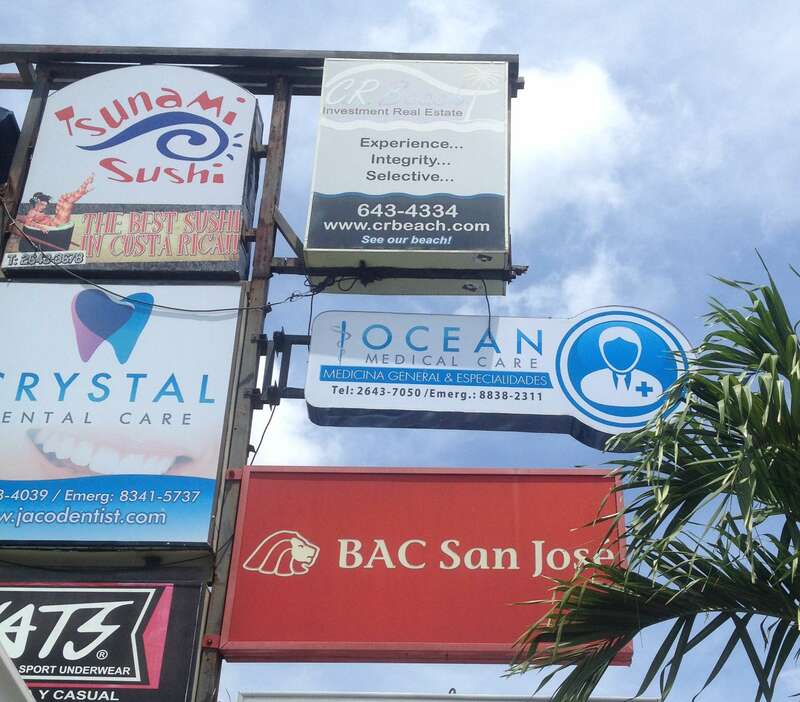 Despite rumors that some of the hospitals here have a relationship with Blue Cross Blue Shield, it seemed pretty clear to us that our U.S. insurance coverage wouldn’t be accepted in Costa Rica. So we opted for a high-deductible, international insurance plan which is designed to cover catastrophic events more so than routine care. What this means is that we pay out-of-pocket for visits like this one, email the receipt to our insurer (which happens to be in the U.K.), and continue to pay out-of-pocket until we meet our deductible. Since office visits are relatively inexpensive in Costa Rica (this one was about $40), we figured this arrangement would work best. We are glad we took Atticus to the clinic. Despite the antibiotic and our efforts to keep the cut germ-free, the infection was serious, even spreading to other fingers. Hector further opened the cut, cleaned it with a scalpel and iodine, lanced the blisters that had formed due to the infection, and taped Atticus up. Atticus smiled the whole time and didn’t flinch at all during the procedure. The office manager leaving for the day. It’s amazing that (a) she worked a shift in these shoes and (b) then rode her scooter home in them. We’ve seen women riding bicycles with similar footwear. Afterwards, we asked Atticus if he liked the doctor, and he responded, “Yes. I wish I had a daddy like that!”. Hmm. A daddy who escaped a dictator, traveled to a developing country to offer humanitarian aid after a catastrophic tragedy, who doesn’t think Atticus cries too much, and who shows empathy even when a child cuts his finger on something he shouldn’t be playing with…that does sound like a pretty cool dad. The irony of taking a year-long family sabbatical to bond with my son only to have him wish a stranger was his father is not lost on me. So we explained to him that life is full of disappointment, he is stuck with this daddy, and he should just try to make the most of it. Above all, we’ve established a relationship with a doctor who seems competent and nice, and who is also a candidate to step into my shoes should something happen to me while we’re down here. All I can say is “OMG”!!! I would have passed out and if my nephew keeps bouncing his head off concrete items, he is going to end up in one of my special needs classrooms with traumatic brain injury as his disability code!!! Ha! I think he has a harder than average head, both figuratively and literally. But we’d better keep an eye on any cumulative effects. First thing is I am very glad that Atticus is okay secondly I could not put down my phone for reading the entire story. Third thing please go buy a blowup air mattress to lay beside Atticus’s bed at night. Brian, the air mattress solution was exactly the thought that was going through my mind at the time. In fact, the next morning, I grabbed rugs we had here in the house and lined them on each side of his bed. I’m not sure how much they will help, but they can’t hurt. Excellent idea. Although, Atticus would probably find a way to puncture it with a tool from his pocket we didn’t know he had. Man he sounds a lot like the stories I’ve heard about you as a baby! Getting a hold of things and taking them apart and all to see what’s inside. Yep. There is no doubt about it. I have the child I deserve. I hope yours is mellow like you.